​Much of the construction will take place under the bridge, without any impact to traffic. This work will be scheduled for weekdays. Construction that impacts traffic will usually take place at night or on weekends, when there are fewer vehicles on the road. Nighttime lane closures: Construction will require intermittent nighttime lane closures, between 8 p.m. and 6 a.m. Flaggers will provide traffic control, with delays up to 20 minutes. Emergency service vehicles will be given priority through the work zone. Daytime lane closures: Daytime lane closures will be allowed as long as traffic moves efficiently through the work zone. If long delays occur during daylight hours, construction may be moved to night. Pedestrians may be delayed up to 20 minutes when the bridge is closed to vehicular traffic. At all other times, at least one sidewalk will remain open. ​The project bid on August 24, 2017. Throughout the fall of 2017, prime contractor Hamilton Construction coordinated the manufacture of components needed for the project. Construction began in March 2018. All work is to be completed by fall 2019. Problems with the Isthmus Slough Bridge include extensive cracking and exposed rebar on the deck of the westerly approach spans, pack rust in the truss elements, broken welds and missing bolts. The electrical and mechanical systems of the drawbridge are old and require frequent repair. This project will repair and resurface the deck, modify the deck drains, reconstruct expansion joints, seal cracks on the concrete surface of the bridge, repair welds, replace bolts, remove rust, and replace the electrical system. OR 241 | Oregon 241, MP 0.5 -- The Isthmus Slough Bridge connects south Coos Bay with the community of Eastside. Keep up to date by visiting this web page or signing up for project updates and traffic alerts. 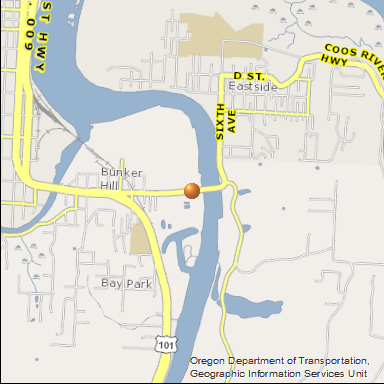 Project updates: ODOT will notify the public prior to any bridge closures or other big traffic impacts. Visit our GovDelivery page to sign up for e-mail updates​.